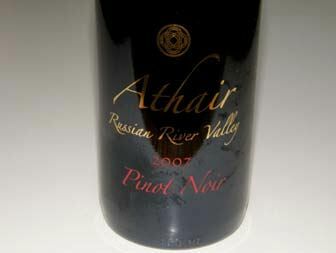 Athair means “father” in Irish Gaelic. The label is a collaboration between Tom Keith and his son-in-law, Jim McMahon. McMahon learned his winemaking at Kenwood Winery in Sonoma Valley, and subsequently at Luna Vineyards in Napa Valley where he is currently the assistant winemaker. Jim McMahon crafts the wines in memory of the fathers in his life. Very nice example of Russian River Pinot Noir - not too light, not too big, just right. The wines are sold on the website with some retail distribution. 707-732-6896.